The Vine-yl Blog: WORLD OF WARCRAFT: EVIL TERRORIST PLOT TO KEEP PEOPLE FROM GETTING ANY WORK DONE? YES. WORLD OF WARCRAFT: EVIL TERRORIST PLOT TO KEEP PEOPLE FROM GETTING ANY WORK DONE? YES. and have allowed basketball postings to take up much of the site. It's not my fault. 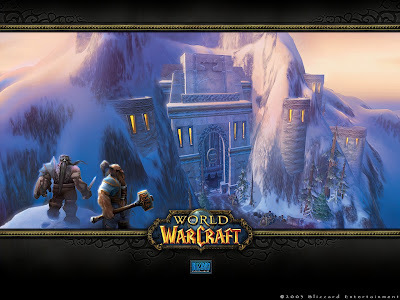 A "friend" of mine, who shall remain nameless, convinced me to try out The World Of Warcraft 10 day free trial. "It'll be awesome," he said, "We'll all play together," he coerced. 6 days later I'm completely addicted, though I did manage to not play for an entire day. My "friend" who is now a level 12 mage and rising, knew of my secret love of video games. He knew that I had been known to play games for 10 hours straight. The fact of the matter is, he knew that I was a geek. But, that didn't stop him from introducing me to what could be the end of me ever getting any work done ever again. I've never liked a role playing game before this one. I know I'm late to discover it, but it is pretty friggin' awesome. The fact that you can play at your own pace, that the more you play the cooler stuff you accrue and the fact that there seems to be an infinite amount of play time makes it incredibly addictive. Now, add that to the fact that you can play with your friends and you've got one of the greatest time suckers ever invented. Every time I log in (I'm a warrior by the way, level 9 at the moment) and I play for a while and I think I want to stop, I see a group pass by me on their pink sabertooth tigers, and griffins and mastadons and I say to myself, "don't stop, this too can be you some day, if you just stop doing anything else and concentrate on what really matters, questing and gaining experience points." Yes I know, I said it before and I'll say it again, I am a geek.